An unlucky outcast. A girl with a juicy secret. A supernatural date with destiny. Chuck McWilliams can't catch a break. His dad just lost his job, forcing them to move far away from his friends and everything he's ever known. He's immediately ostracized at his new school. Chuck even takes a pounding from a pack of bullies during a cross country meet. When the "weird girl" of the freshman class asks him to homecoming, Chuck resigns himself to his loser status and accepts. What he doesn't know is that his new dance partner is a lot more than she seems. And she's about to show him that he has a ton more to offer than he ever thought possible. As long as they can live long enough to fight off the vampires storming the dance... 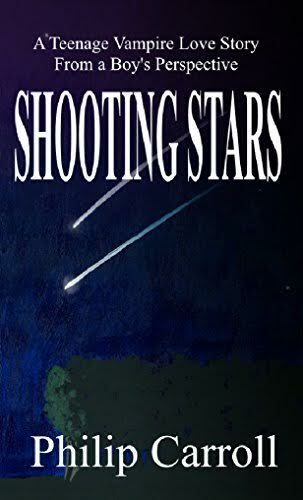 Shooting Stars: A Teenage Vampire Love Story from a Boy's Perspective is the first installment in a series of young adult paranormal romance books. If you like sweet teenage love stories, bloodthirsty vampires, and page-turning paranormal action, then you'll love Philip Carroll's new take on the teen vampire story.